In a competitive, timed situation it helps to stay calm, listen to each others suggestions, contribute and work together. We were more successful as a team because we communicated well and we stayed focused the whole time. 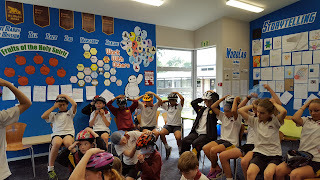 on the 27th and 28th of November all the year sixes at school had a cycle safety program. first we all had to check if our helmets were safe before we went out to ride. If your helmet wasn't safe you had to borrow one of theirs. The instructors looked through everyones helmets to see if they if they had cracks in them. I had a great time doing cycle safety. today in church reverend Ben told us a story called the old shoe maker in this post i will be retelling the story. it was Christmas Eve. In a small Russian village, children were playing in the streets. Down the street shuffled an old shoemaker. He waved at the children as he made his way to his small shop on the corner. Everyone loved the old shoemaker. He went inside and got to work making and mending shoes. The old shoemaker he stopped and stood in the window of his shop. He listened to the shouts of laughter as the children played, but his thoughts were far away. He didn have a family, and on Christmas Day he would be alone. He picked a big book from a shelf, and rested in his big old chair. He moved his fingers along the lines of the book. It was the story of Christmas. He read how the Wise Men had brought gifts for Jesus-the best gifts they could offer. He scratched his head, looked round his little room and thought, "If Jesus visited me, what would I be able to give Him?" Then he sat back in his chair, pulled up his favorite blanket and the heat of the fire made him tired. Outside, the children returned to their homes. A small group of children huddled together. They didn´t have a warm home to go to. They didn´t have parents to care for them. They were orphans. Slowly they made their way to the cold, empty orphanage and huddled together to keep warm. He set to work at once. As he worked, the old shoemaster suddenly heard footsteps. He rushed to the window. But it wasn't Jesus.It was a young boy lighting lamps along the street. His coat was threadbare and he shivered as he worked. "How cold he looks," thought the old shoemaster, "I could give him my blanket, I still have other gifts for Jesus." He shuffled outside with his blanket and wrapped it around the shoulders of the young boy. The boy stopped shivering, smiled gratefully, and went on his way. "It's Christmas Day, goodwill on earth,Let's celebrate The Savior's birth.God gave His love, what can I bringThat's worthy of a new-born King? "The old shoemaster smiled and said, "Thank you. You must be so thirsty after your singing. I have hot drinks warming on my stove. I was saving them for a special guest, but I'm sure He won't mind. I have other gifts for Him." He poured them hot drinks and waved them goodbye. The old shoemaster looked at his clock. It was getting late. He must finish making his gift for Jesus.Every so often he would look out of the window to see if Jesus was coming down the street. But no one came. The old shoemaster stared out of his window. Tears streamed down his face. Jesus had promised to visit him, but Jesus had not come. What would he do with all the shoes he had made?As the sun rose in the sky, he looked across the street at the orphanage and wiped his tears away. He had a wonderful idea! He gathered up the shoes into a sack. Then he tiptoed across the street and into the orphanage. He placed a pair of his finest shoes by each child. Then he tiptoed back to his shop, sat in his comfortable chair, and closed his eyes. As he dozed, he heard the same voice he had heard the night before: "Thank you kind shoemaker. I visited you last night and you gave Me warmth. I was thirsty and you gave Me a drink. I was hungry and you fed Me, and, kind shoemaker, I was in the orphanage and you came to visit Me. Thank you for giving Me the finest pair of your shoes. Whatever you did for all these people, you also did for Me. "Christmas bells rang out across the village as the orphans woke to find their gifts. Excited children rushed out to play. The old shoemaker shuffled out to join the Christmas celebrations. It was the happiest Christmas he had ever had! (1)Provide quality feedback on our peers' writing. (2)Consistently use full stops and capital letters. Once long long ago in Ancient china there lived four dragons, the Black Dragon, who was made of dark shadows, the Pearl Dragon, whos scales were crystal clear, the Yellow dragon, who’s scales were luminous like the sun, and the long dragon, whose body was like a snake. The four dragons lived in the sea where they played all day with nothing to worry about. One day as the dragons flew over the Village they heard a cry of despair, the four dragons flew down to the parched Village land. There were no plants or crops to eat and no water to drink. People were on their knees praying for rain. “We should visit the emperor, he can make it rain,” said the Long Dragon “Yes,” said the Pearl Dragon. The four dragons instantly appeared at the emperor’s palace, (which was high up in the clouds.). The dragons flew back to the sea they felt fulfilled and proud of what they did. They knew that soon the emperor would make it rain and the villagers would have food, water and plentiful crops crops to eat. The dragons couldn’t wait hear the people beaming with laughter and happiness. Another week had passed without rain, The people were so eager for food that they were eating grass and clay. So the dragons flew into the sea, gathered up the water and sprayed it into the sky. The people cried with delight “were saved,” they cheered. “yes your honour,” said the Mountain God. The four dragons then turned themselves into four rivers. The black dragon became the Heilongjiang river in the far north, the yellow dragon became the Huang He of central china, the long dragon became the Yangzi Jiang and the pearl dragon became the Zhujiang. Now when it doesn't rain the people still have water. All thanks to the four dragons. Once long long ago in ancient china there lived four dragons: the black dragon whos scales were made of shadows, the pearl dragon whos colours were as clear as a pearl, the yellow dragon with scales of sunlight and the long dragon whoś body stretched out to be as long as a fully grown snake, they lived in the sea where they played all day with nothing to worry about. One day as the dragons flew over the village they heard a cry of despair, They flew down to the village the land was parched and dry, there were no plants or crops and people were on their knees praying for rain. The dragons flew back to the sea they felt fulfilled and proud of what they did. They knew that soon the emperor would make it rain and the villagers would have food to eat and plentiful crops. The dragons couldn’t wait to see the people smile again. Another week had passed without rain, The people were so hungry they were eating grass and clay. When emperor found out what the four dragons had done he summoned them to his palace (in the clouds) “how could you” he shrieked “i am the one who controls the rain not you” The emperor was so enraged he called the mountain god to trap the dragons under four mountains. The four dragons then turned themselves into four rivers. The black dragon became the Heilongjiang river in the far north, the yellow dragon became the huang he of central china, the long dragon became the yangzi jiang and the pearl dragon became the zhujiang. Now when it doesn't rain the people still have water. All because of the four dragons.